"I am with thee; I shall protect thy limbs forever, eternally." "Death Which Is Not Eternal"
Yet who remembers me now? Spreading fear in their wake. And faith that I now weep. thy heart into thy body for thee." 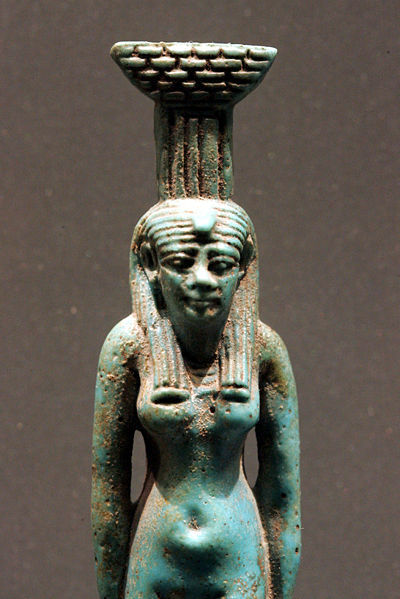 Though often overlooked in modern times, Nephthys was worshipped not only by the Ancient Egyptians, but by the Greeks and Romans as well as the Roman Empire expanded. Nephthys is actually Her Greco-Roman name, meaning Death Which is Not Eternal (alluding to Her primary role as a Goddess of transition for the dead); She was known to the Ancient Egyptians as Nebet-het or Nebt-het, meaning Lady of the House of the Gods. She is called: The Useful Goddess; The Excellent Goddess; Lady of the Temple Enclosure; Protectress of the Sacred Phoenix; Dweller Within Senu; Lady of Heaven; Mistress of the Gods; Great Goddess, Lady of Life. She appears within numerous tomb inscriptions and papyrus scrolls, including the Pyramid Texts, the Book of the Dead, and The Burden Of Isis, as a protector and guide to the deceased, leading them through the various levels of the Afterlife as that they may move on into their next incarnation. 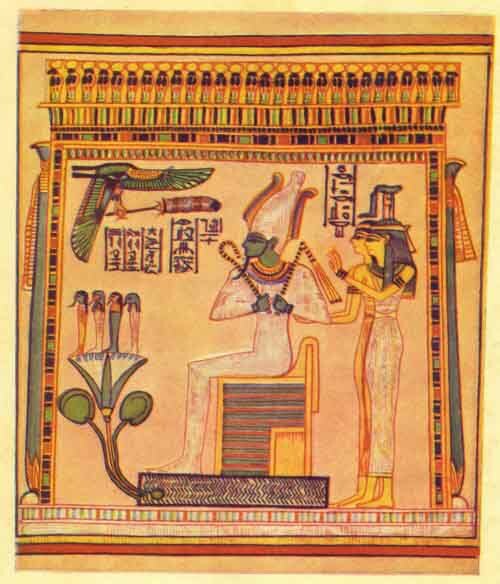 Nephthys is the twin sister of Isis, distinguished in paintings only by the hieroglyphs on their heads; while Isis is shown crowned by the throne hieroglyph, Nephthys is differentiated by a bowl balanced on top of a house (or pillar). She was seen as the eternal protector of the Pharaohs, guarding them in life and death, fighting off their enemies with Her fiery breath, just as She protected Her brother, Osiris. Despite Her marriage to Set, the murderer of Osiris, She helped Isis gather the pieces of His body, binding them together, and filling His lungs with the Breath of Life, resurrecting Him. It was the mournful cries of the Goddesses that summoned His spirit back to His body, as is seen in The Burden Of Isis, particularly in The Laments Of Isis And Nephthys. Within the Pyramid Texts, Her hair is described as the linen bandages of the mummy: "Raise thyself up, shake off thy dust; remove the dirt which is on thy face; loose thy bandages. They are indeed not bandages; they are the locks of Nephthys." Rather than focusing on death and decay, this shows Her as a figure associated with renewal and rebirth. She also appears frequently with Isis, working with Her renowned sister. 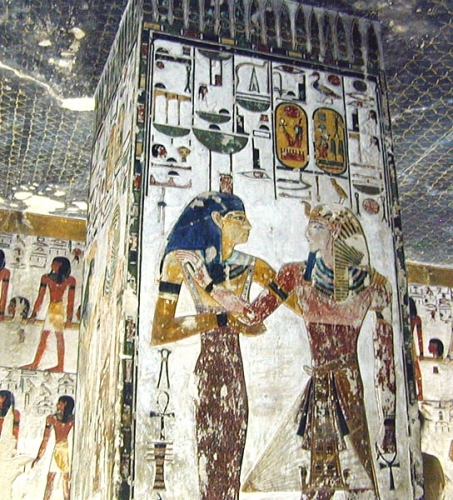 Both Isis and Nephthys appear on virtually every sarcophagus from the 18th Dynasty (1550-1292 BCE), protecting, guiding and healing the deceased. As such, they are invoked in virtually all of the funerary rites, arguably the most important magickal rites of the Egyptian culture. Not all of the transitions involving Nephthys surrounded death and rebirth, however. 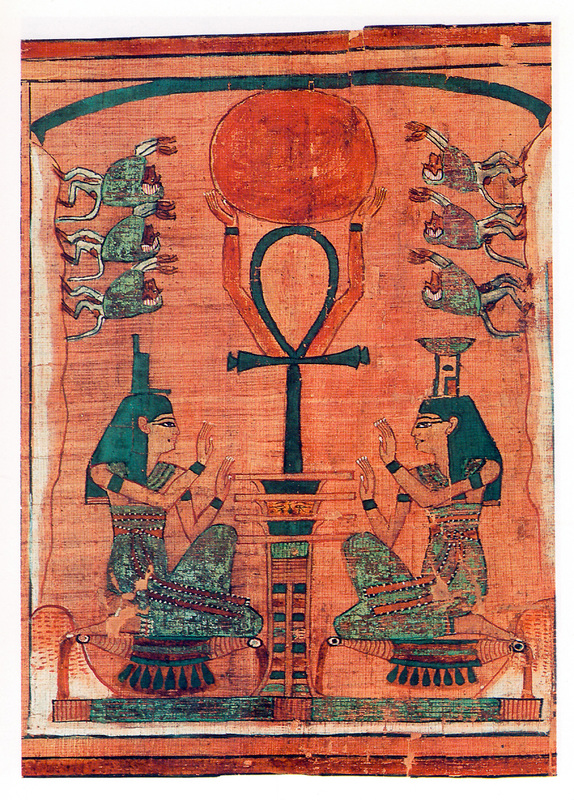 She is also shown as the nursemaid of Horus, son of Isis and Osiris. It was only with the aid of Nephthys' watchful gaze that Horus lived long enough to fulfill His revenge against Set. She also appears with Isis during childbirth, standing at the head of the bed to comfort the mother, while Isis serves as midwife. These Divine Twins complement each other beautifully: while Isis is primarily a Goddess of birth and life, Nephthys rules over death and rebirth; while Isis is a physical healer, Nephthys heals the mind and soul so that reincarnation may occur. It is little wonder then to see that both are said to ride with Ra in His boat, with Isis appearing at dawn, and Nephthys at dusk, showing their place among the Great Ennead, the nine original solar deities of Heliopolis (along with Ra, Shu, Tefnut, Geb, Nut, Osiris and Set). great gods, who support the Two Enneads. Isis weeps for thee; Nephthys calls thee...."
Carve an ankh on one side of the white Goddess candle and the hieroglyph for Nephthys (seen in the images on this page, crowning Her head) on the other side; if you can't fit this on the candle, write both symbols on a slip of paper and place it underneath the candle's holder. Carve the name of the deceased on their candle. Carve a heart on the loved ones' candle. Carve an ankh on each of the black candles. Place the departed and loved ones candles in the centre of the altar with the Goddess candle, forming a triangle or pyramid with the Goddess candle at the top point. Place the crystals in a circle around these candles, alternating rose quartz, moonstone, and amethyst. Then place the black candles in a circle surrounding the crystals and triangle of candles, so that you end up with a triangle enclosed in two concentric circles. You can decorate the space with pictures of the deceased, or cherished items that bring fond memories of him/her. Come to this space, come to me! Blessed Nephthys, hear this plea! Beloved Nephthys, hear this plea! Come to this space, come to me!" Guidance to her/his next life. All ills, soothing all troubles. At a time of her/his choosing." For ____________ who has departed. Mighty wings about their shoulders. Shared with them by ______________. Rather than pain and longing." Ask the participants to share fond memories of the departed. When everyone has had a chance to share, have them all say in unison, "Safe journey to you, dear one!" Thank the elements. Open the circle. Extinguish the candles. Share a feast featuring the favourite dishes of the deceased, and continue to share fond memories. Play music that was loved by the deceased, dance if you so choose, play games that brought you joy with the deceased. An extra place should be set at the table in honour of the departed. Have each person place a bite of food from their plate onto the plate of the deceased; likewise, have them place some wine/juice from their glass in the deceased's glass. If possible, bury these offerings with the body/ashes of the deceased, along with the remnants of the ritual; if not, bury them in a hole on the property of the deceased. "Thy libation is poured by Isis, Nephthys has purified thee -- they two sisters great and powerful, who collected thy flesh, who bound together thy limbs, who made thy two eyes to appear in they face -- the boat of the evening and the boat of the morning, Atum has given to thee, and the Two Enneads have made for thee." The Pyramid Texts. Translated by: Samuel A. B. Mercer, 1952. The Book of the Dead. Papyrus of Ani. Translated by: E. A. Wallis Budge, 1895. The Burden Of Isis: Being The Laments Of Isis And Nephthys. Berlin Papyrus 14225. Translated by: James Teackle Dennis, 1910. 365 Goddess. By: Patricia Telesco.